Clicking on an image will get you a 500 x 700 size image, clicking on BIG (if there) will get you a 1000 x 1500 image. The N5AU station was designed for mutli-multi from the ground up. An extra room was added to the new house plans. The operating room was about 23 feet by 20 feet. It was wired with a lot of 220 volt outlets, 110 volt strips around the room and hardline. Rotator cables and other feedlines were put in the walls while the house was under construction. There was more concrete under the towers then under the house. The picture to the right shows the 40 meter position on the left, the 15 meter position in the middle and then the 10 meter position on the right. The photo on the left is a veiw looking back from 10 meter operating position. 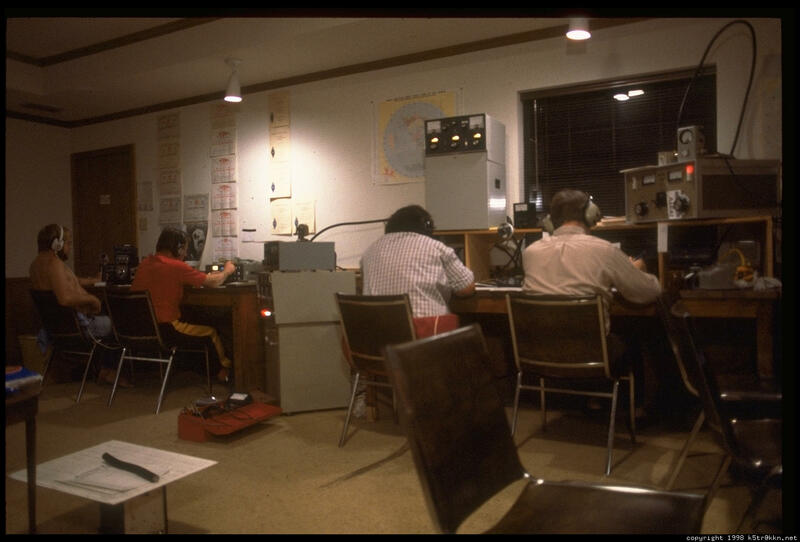 From left to right you can see Ralph N5RZ on 160 meters (the "Gator band"), Mori KN6M on 80 meters, Gary KM5X on one of the 40 meter stations and Conrad N5CR on the other 40 meter station. 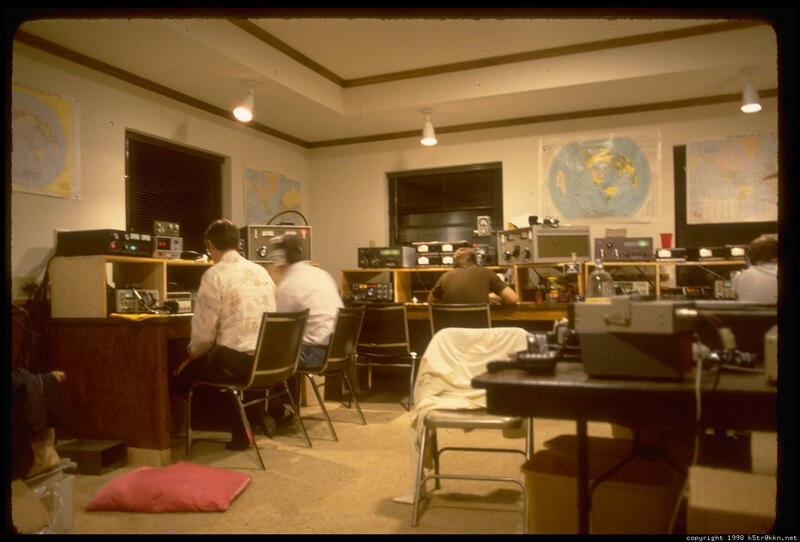 Conrad and Gary were our usual 40 meter operators on 40 SSB. Ralph was often found on 160 meters or sometimes on 80 meters. He also was know to get on the other bands as needed. Mori helped us out a few times over the years and he was usually found on 80 meters. He also put in some 20 meter duty as well. During a multi-multi effort we set up two stations on 10, 15, 20 and 40 meters. The second station was used to tune the band looking for and working multipliers. In the days before wide spread packet spotting this was the only way to make sure that you were not missing anything on the bands. Depending on the directions the antennas on each station were pointed we could listen quite well on the second radio. In this photograph you can see the typical setup for each band. The main radio and amp is on the right with the second station's radio and amp on the left. This is 15 meters. 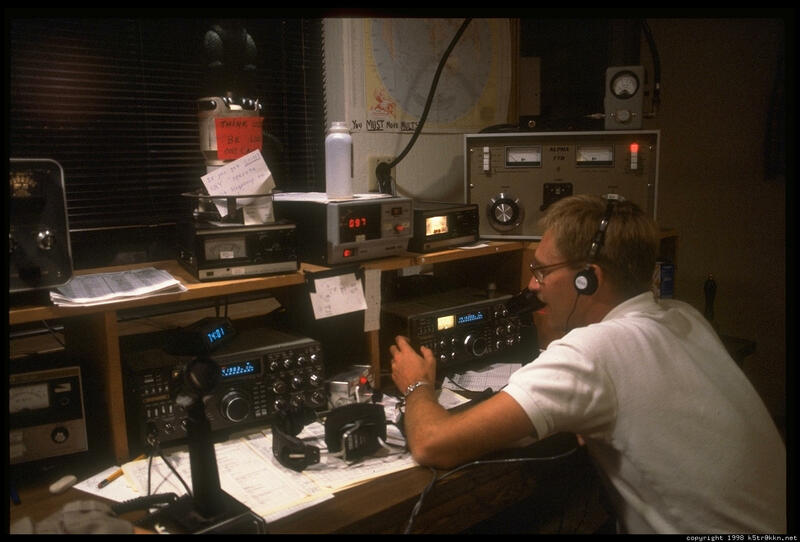 Here is Pete N5TR calling CQ on a mostly dead 20 meter band. 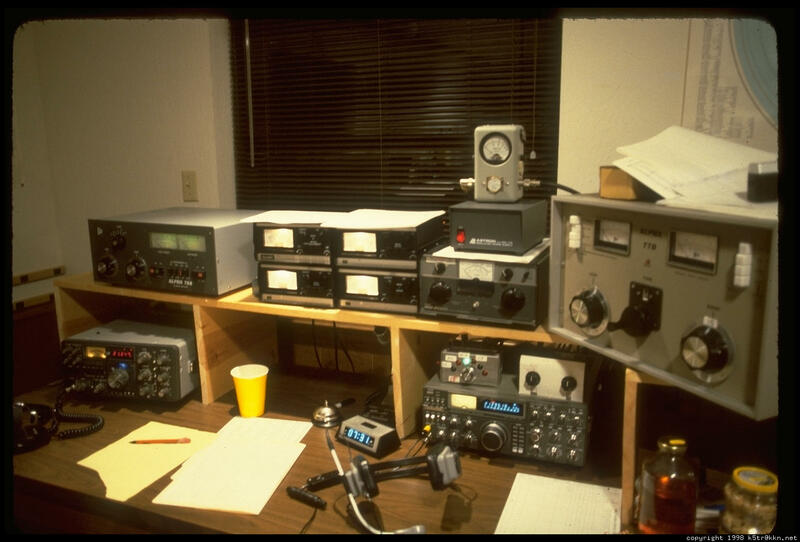 As you can see we again have two stations set up on the 20 with the main rig and amp on the right and the mult station on the left. You will also note a few of the many "toys" and "signs" around the 20 meter operating positon. 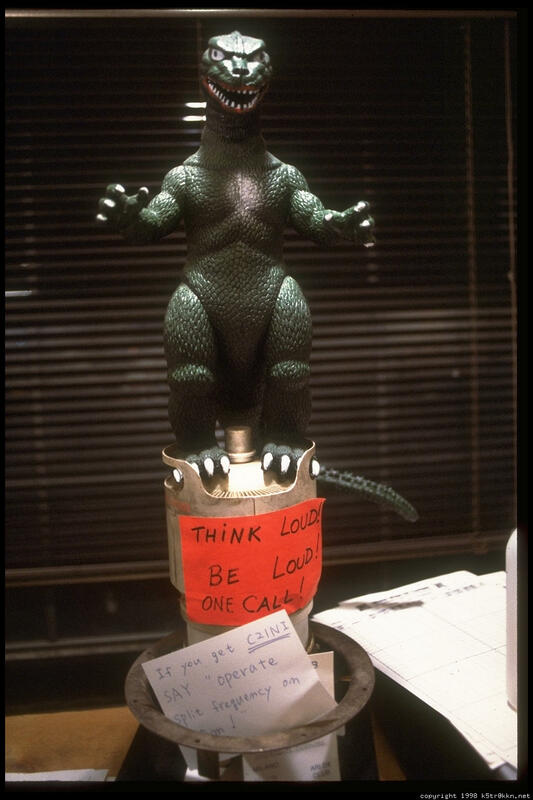 The sign on the tube below Godzilla states" Think Loud!, Be Loud!, One call!" 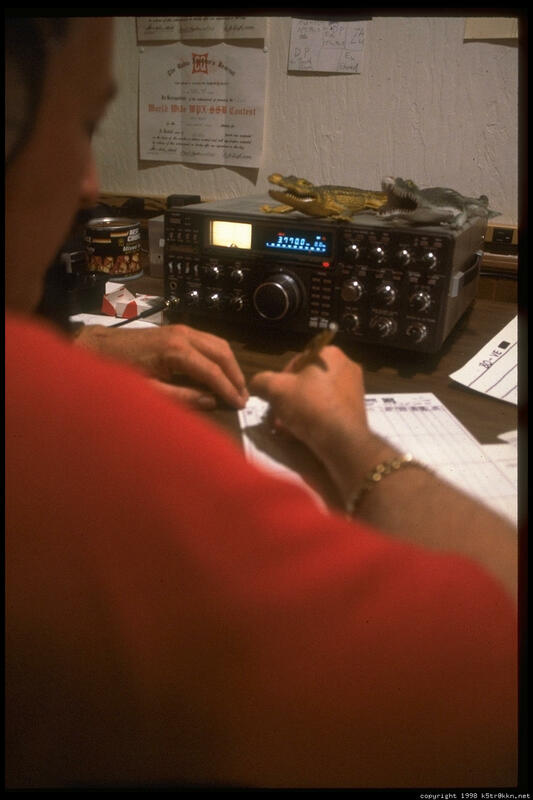 The index card is one of the many notes that were passed among the stations used to inform the others of passed DX stations or in this case telling the 20 meter op to tell C21NI to listen up in the US phone band on 40 meters. 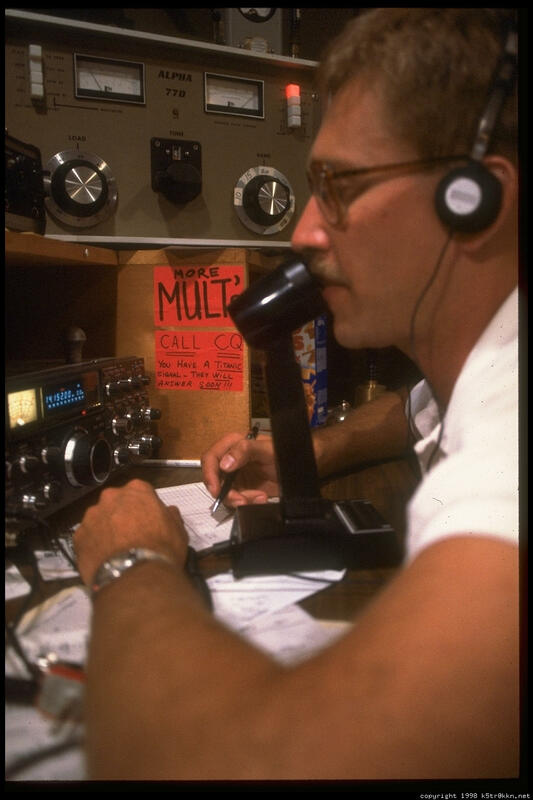 In the other picture you can see a sign just to the right of the radio, it reads, "More Mults" and below that, "Call CQ, You have a titanic signal - they will answer soon!!!" One of my favorites was at the 10 meter station and it said, " How to win multi-multi. 1. Stay in chair. 2. Call CQ." Because N5RZ was operating 160 meters, and because we started calling 160 the "gator band" Ralph got nicknamed "The Gator". So of course we had to have a few gators around the shack - here are two perched on top of the 80 meter radio.